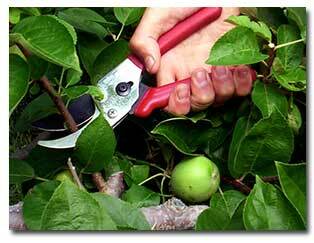 All deciduous fruit trees need to be pruned at least once a year for good shape and to bear fruit. The time to do major pruning is during the winter. The rule of thumb with pruning deciduous fruit trees is to prune while the trees are dormant, after the leaves have fallen to the ground but before new buds have swelled. The time to do the major pruning is generally January (unless you did the job in December). Each type of fruit tree needs to be pruned differently, so it’s important to know which kind of tree you’re pruning and how to prune it properly. For example, apples bear their fruit on spurs that bear again and again, sometimes for as long as twenty years. If you whack off all the spurs you’ll have no fruit. However, peaches and nectarines bear their fruit on one-year-old wood. By pruning them hard, you encourage new growth to replenish fruiting wood. The best shape also differs among types. Apple and pear trees, for instance, do best with a central trunk, with shorter branches at the top, longer ones on the bottom. Peaches and plums do best with an open-center shape (kind of like a bowl). No two trees, even of the same type, can be pruned exactly alike; basic guidelines will apply differently according to the placement of their branches, their age, and their overall vigor. If you’re not an expert, follow a pruning manual (one that contains charts) that applies to your climate and type of tree. When you buy a fruit tree, ask us for the best pruning method to use for that tree. Pruning a young tree properly to start with will save you a lot of time and effort later. If you are dealing with a large old tree that has been neglected for some time, keep in mind that it may require several years of pruning to bring it back to where it should be. Your primary goal is to open the tree so that sunlight can penetrate inside of the foliage during the fruiting season and to shorten the taller limbs to bring the fruit production down to a more manageable height. It is safest to call a professional to do the high work and any large branch removal for you. They have the experience and equipment needed. Remember after pruning deciduous fruit trees to clean up the ground under the tree and follow up immediately with dormant spray.